David Prowse as Darth Vader in The Empire Strikes Back. Darth Vader (born Anakin Skywalker) is a fictional character in the expanded universe of television series, video games, novels, literature and comic books. Originally a Jedi prophesied to bring balance to the Force, he falls to the dark side of the Force and serves the evil Galactic Empire at the right hand of his Sith master, Darth Sidious. He is also the father of Luke Skywalker and Princess Leia Organa. In the first draft of The Star Wars, tall, grim general "Darth Vader" was already close in line with his final depiction, and the protagonist "Anikin Starkiller" had a role similar to Luke Skywalker's as the 16-year-old son of a respected warrior. Vader's mask was originally designed by Ralph McQuarrie as part of Vader's spacesuit and not intended to be part of the regular costume. Brian Muir sculpted Vader's costume based on McQuarrie's design. After the success of Star Wars, Lucas hired science fiction author Leigh Brackett to write Star Wars II with him. They held story conferences and, by late November 1977, Lucas had produced a handwritten treatment. The treatment is similar to the final film, except that Vader does not reveal he is Luke's father. In the first draft that Brackett would write from this, Luke's father appears as a ghost to instruct Luke. Lucas was disappointed with the script, but Brackett died of cancer before he could discuss it with her. With no writer available, Lucas had to write the next draft himself. In this draft, he made use of a new plot twist: Vader claiming to be Luke's father. According to Lucas, he found this draft enjoyable to write, as opposed to the year-long struggles writing the first film. The new plot element of Luke's parentage had drastic effects on the series. Michael Kaminski argues in his book that it is unlikely that the plot point had ever seriously been considered or even conceived of before 1978, and that the first film was clearly operating under an alternate storyline where Vader was a separate character from Luke's father; there is not a single reference to this plot point before 1978 as Obi-Wan Kenobi referred to him as "Darth" as if it is his true name rather than the Sith title. After writing the second and third drafts in which the point was introduced, Lucas reviewed the new backstory he had created: Anakin had been Obi-Wan's brilliant student and had a child named Luke, but was swayed to the dark side by Palpatine. Anakin battled Kenobi on the site of a volcano and was badly wounded, but was then reborn as Vader. Meanwhile, Kenobi hid Luke on Tatooine while the Galactic Republic became the tyrannical Galactic Empire and Vader systematically hunted down and killed the Jedi. This change in character would provide a springboard to the "Tragedy of Darth Vader" storyline that underlies the prequels. After deciding to create the prequels, Lucas indicated the series would be a tragic one depicting Anakin's fall to the dark side. He also saw that the prequels could form the beginning of one long story that started with Anakin's childhood and ended with his death. This was the final step towards turning the film series into a "Saga". For the first prequel, Lucas made Anakin nine years old to make the character's separation from his mother more poignant. Movie trailers focused on Anakin and a one-sheet poster showing him casting Vader's shadow informed otherwise unknowing audiences of the character's eventual fate. The movie ultimately achieved a primary goal of introducing audiences to Anakin. Michael Kaminski, in The Secret History of Star Wars, offers evidence that issues in Anakin's fall to the dark side prompted Lucas to make massive story changes, first revising the opening sequence of the third prequel to have Palpatine kidnapped and his apprentice murdered by Anakin as the first act in the latter's turn towards the dark side. After principal photography was complete in 2003, Lucas made even more massive changes in Anakin's character, re-writing his entire turn to the dark side; his fall from grace would now be motivated by a desire to save Padmé Amidala rather than the previous version in which that reason was one of several, including that he genuinely believed that the Jedi were plotting to take over the Republic. This fundamental re-write was accomplished both through editing the principal footage, and new and revised scenes filmed during pick-ups in 2004. Darth Vader was portrayed by bodybuilder David Prowse and by stunt performer Bob Anderson during the character's intense lightsaber fight scenes. James Earl Jones provided Vader's voice, but was initially uncredited in A New Hope and The Empire Strikes Back because he felt his contributions were too small to warrant recognition. The character has also been voiced by Scott Lawrence and Matt Sloan for several video games. Anakin Skywalker has been portrayed by Sebastian Shaw in Return of the Jedi, Jake Lloyd in The Phantom Menace, and Hayden Christensen in Attack of the Clones and Revenge of the Sith and appears briefly reprising the role in the final scene of Return of the Jedi. The character has also been voiced by Mat Lucas for the 2003 micro-series and Matt Lanter in the CGI 2008 film and later animated TV series. Introduced in Alderaan with the Death Star's superlaser. While the princess is being rescued, Vader fights Obi-Wan in a lightsaber duel and kills his former master. During the film's climactic battle scene, Vader leads a squadron of TIE fighters and destroys several Rebel fighters. Vader pursues Luke's X-Wing fighter, but an attack from Han Solo's Millennium Falcon clips him and sends him flying into deep space. Three years later in Chewbacca, C-3PO and R2-D2 on Cloud City and uses them as bait for Luke. He has Han tortured, frozen in carbonite and delivered to bounty hunter Boba Fett, but Leia, Chewbacca and the droids escape thanks to Lando Calrissian. Vader engages Luke in a lightsaber duel, which ends when Vader cuts off Luke's right hand and reveals that he is Luke's father; he then entreats Luke to turn to the dark side so they can "rule the galaxy as father and son". Horrified, Luke throws himself into Cloud City's reactor core and ultimately escapes aboard the Millennium Falcon. Onboard his Star Destroyer, Vader telepathically tells Luke that it is his destiny to join the dark side. Sebastian Shaw as Anakin Skywalker unmasked and redeemed in Star Wars Episode VI: Return of the Jedi. One year later in Star Wars Episode VI: Return of the Jedi, Darth Vader arrives aboard the half-constructed second Death Star. He intimidates the battle station's commander, Moff Jerjerrod, into stepping up construction. When Emperor Palpatine personally arrives, he assures Vader that the two of them will turn Luke to the dark side. Luke surrenders himself to Vader in the hope that he can turn his father back "to the light side". Vader brings Luke onto the Death Star, where the Emperor tries to seduce Luke to the dark side. A lightsaber duel erupts between father and son, during which Vader learns Leia Organa is Luke's twin sister and threatens to turn her to the dark side if Luke will not submit. Enraged, Luke attacks and overpowers Vader, severing his mechanical right hand. Realizing he is close to suffering his father's fate, Luke refuses the Emperor's command to kill Vader and take his place. Enraged, the Emperor unleashes a torrent of Force lightning upon Luke. The sight of Luke's agony breaks the dark side's hold on Vader, and Anakin Skywalker kills the Emperor by throwing his former master down the Death Star's reactor shaft. In the process, however, Anakin is mortally wounded by the Emperor's lightning. Redeemed, Anakin asks Luke to remove his helmet so he could look at Luke with his own eyes. With his dying breath, he tells his son that there was good left in him after all. Luke escapes the Death Star with his father's remains, which he later ceremonially burns in a funeral pyre. As the Rebels celebrate the destruction of the Death Star and the fall of the Empire, Luke sees his father's spirit, standing alongside those of Obi-Wan and Yoda. In Star Wars Episode I: The Phantom Menace, Anakin Skywalker appears as a nine-year-old slave. Raised on the planet Tatooine by his mother Shmi, Anakin had no father, implying miraculous birth. He is a gifted pilot and engineer and has the ability to "see things before they happen". He even creates his own protocol droid, C-3PO. Jedi Master Qui-Gon Jinn meets him after an emergency landing on Tatooine. After discovering that Anakin's blood has an unusually high number of midi-chlorians (a measure of Force potential), Qui-Gon becomes convinced the boy is the "Chosen One" of Jedi prophecy who will bring balance to the Force. Anakin wins his freedom in a podrace, but is forced to part with his mother. Qui-Gon takes Anakin to the Jedi Council, but they forbid training on the grounds that the boy's future is clouded by the fear he exhibits. During the film, Anakin forms a close bond with Naboo queen Padmé Amidala. During the invasion of Naboo, Anakin helps defeat the Trade Federation by destroying their command ship. After Qui-Gon is killed in a duel with Sith Lord Darth Maul, his apprentice Obi-Wan Kenobi promises to train Anakin, a proposal the Jedi Council reluctantly accepts. The Galactic Republic's newly elected Chancellor Palpatine befriends the boy, promising to "watch your career with great interest". Ten years later in Star Wars Episode II: Attack of the Clones, Anakin Skywalker is depicted as the apprentice of Jedi Knight Obi-Wan Kenobi. Chancellor Palpatine assigns Anakin and Obi-Wan to investigate an assassination attempt made on Senator Padmé Amidala. Anakin travels with Padme to Naboo, where they fall in love. Anakin has a vision of his mother in pain and goes to Tatooine, where he learns that she had been kidnapped by Tusken Raiders. He goes to the Tusken camp, where he discovers too late that his mother has been tortured to death. Overcome with rage, Anakin kills the entire Tusken tribe. After he returns with his mother's body, he reveals his crime in devastation. Soon after, Anakin and Padmé travel to Geonosis to rescue Obi-Wan from Sith Lord Count Dooku (Darth Tyranus) and his Separatist army, but they are instead captured and sentenced to death. Anakin and Padmé profess their love for each other moments before being rescued by an army of clone troopers and Jedi. During a lightsaber duel with Tyranus, Anakin loses his right arm and later has it replaced with a prosthetic. At the end of the film, Anakin and Padmé marry in a secret ceremony. 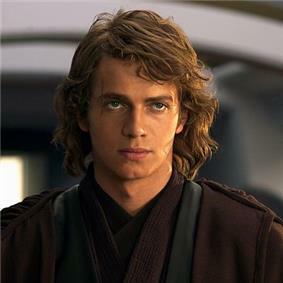 Hayden Christensen as Anakin Skywalker in Star Wars Episode III: Revenge of the Sith. Three years later in Star Wars Episode III: Revenge of the Sith, Anakin Skywalker is a Jedi Knight and hero of the Clone Wars. He and Jedi Master Obi-Wan Kenobi lead an attempt to rescue Supreme Chancellor Palpatine after he is kidnapped by Separatist leader General Grievous. During the rescue, Anakin defeats Count Dooku in a lightsaber duel and decapitates him in cold blood on Palpatine's urging. When he returns to Coruscant, he meets with Padmé Amidala, now pregnant with his progeny. That night, he has a vision of Padmé dying in childbirth; he fears it will come true, as it is similar to visions he had before his mother died. Meanwhile, Palpatine names Anakin his representative on the Jedi Council; the Council, suspicious of Palpatine's dictatorial power in the Senate, denies Anakin the rank of Jedi Master and asks him to spy on Palpatine. Palpatine eventually reveals to Anakin that he is Sith Lord Darth Sidious, the mastermind of the war, and that the dark side holds the power to save Padmé's life. Conflicted, Anakin reports Palpatine to Jedi Master Mace Windu. Despite orders to remain behind, Anakin follows Windu to the Chancellor's office to ensure Palpatine is captured alive. He walks in on Windu ready to kill Palpatine and intervenes on the Sith Lord's behalf, severing Windu's lightsaber arm; Palpatine then kills Windu with a blast of Force lightning. Desperate to save his wife, Anakin pledges himself to the dark side and becomes Palpatine's Sith apprentice Darth Vader. On Palpatine's order, Vader leads a squadron of clone troopers to lava flow and sustains life-threatening third-degree burns. Obi-Wan shouts at Anakin that he was meant to bring balance to the force, not destroy it, picks up his former friend's lightsaber and leaves him to die. However, Palpatine finds Vader and has his ruined body reconstructed with the cybernetic limbs and the black armor seen in the original trilogy. When Vader regains consciousness, Palpatine tells him Padmé died as a result of his anger, devastates Vader. Vader is last seen alongside Palpatine and Tarkin viewing the original Death Star's construction. In the animated series Star Wars: Clone Wars, Anakin Skywalker has many adventures, including: a fierce lightsaber duel with Dark Jedi Asajj Ventress; becoming a Jedi Knight despite the Jedi Council's reservations; and taking part in a mission to free a warrior clan from the Separatists, during which he sees a cryptic vision of his future as Darth Vader. In the 2008 animated film Star Wars: The Clone Wars and the subsequent television series, Jedi Knight Anakin Skywalker takes on Padawan Ahsoka Tano. He will appear in Star Wars Rebels voiced by James Earl Jones. He hired the Inquisitor to hunt down the remaining Jedi across the galaxy. Darth Vader appears numerous times in comic books such as Dark Horse Comics's Star Wars Tales and Marvel Comics' Star Wars series (1977–1986). In James Luceno's Dark Lord: The Rise of Darth Vader (2005), set a few months after the events of Revenge of the Sith, Vader disavows his Anakin identity as he systematically pursues and kills the surviving Jedi and cements his position in the Empire. The novel also reveals that Vader plans to eventually overthrow Palpatine, and that he betrayed the Jedi because he resented their supposed failure to recognize his power. Vader's Quest (1999) depicts Vader hiring a bounty hunter to bring him information about the pilot who destroyed the Death Star, ultimately meeting Luke for the first time. In the novel Splinter of the Mind's Eye (1978), Vader and Luke duel for the first time, and Luke cuts off Vader's right arm. Shadows of the Empire (1996) reveals that Vader is conflicted about trying to turn his son to the dark side of the Force, and knows deep down that there is still some good in him. Anakin's redeemed spirit appears in The Unifying Force (2003), Anakin tells his grandson Jacen Solo to "stand firm" in his battle with the Supreme Overlord of the Yuuzhan Vong. In The Dark Nest trilogy (2005), Luke and Leia uncover old recordings of their parents in R2-D2's memory drive; for the first time, they see their own birth and their mother's death, as well as their father's corruption to the dark side. In Bloodlines (2006), Jacen—who has himself turned to the dark side—uses the Force to "watch" Anakin slaughter the children at the Jedi Temple. Darth Vader plays a central role in Star Wars: The Force Unleashed (2008). He is a playable character in the first level of the game, where he and his armies invade Kashyyyk to hunt down a Jedi who had survived the Order's destruction. Vader kills the Jedi and kidnaps the man's young Force-sensitive son, whom he raises as his secret apprentice. Vader sends Starkiller (the game's protagonist) on various missions throughout the galaxy, with an ultimate goal to assassinate Palpatine so that Vader can rule the galaxy himself. Toward the end of the game, however, it is revealed that Vader isn't planning to overthrow Palpatine at all; he is merely using his apprentice to expose the Empire's enemies. At the game's climax, the player chooses between attacking Palpatine to help his Rebel friends escape the Death Star or killing Vader to become the Emperor's new apprentice. He also appears in the sequel Star Wars: The Force Unleashed II as the main antagonist and final boss. Vader is also a playable character in the video games Lego Star Wars: The Video Game, Lego Star Wars II: The Original Trilogy, Lego Star Wars: The Complete Saga, Soulcalibur IV, Star Wars: Battlefront II, Star Wars: Empire at War, Star Wars: Empire at War: Forces of Corruption and Star Wars: Galactic Battlegrounds. He also is an active but non-playable character in Star Wars Galaxies, Star Wars: Battlefront, (as an evil pig) is a non-playable character in Angry Birds Star Wars and is a playable character in Angry Birds Star Wars II. Anakin Skywalker is a playable character in the video games Star Wars: Battlefront II, Lego Star Wars: The Video Game, Lego Star Wars II: The Original Trilogy, Lego Star Wars: The Complete Saga, Star Wars: The Clone Wars - Lightsaber Duels, Star Wars: The Clone Wars - Jedi Alliance, Star Wars: The Clone Wars - Republic Heroes and is featured (as an Angry Bird) in Angry Birds Star Wars II. In Attack of the Clones, Anakin Skywalker feels "smothered" by Obi-Wan Kenobi and is unable to control his life. By Revenge of the Sith, however, his "father-son" friction with his master has matured into a more equal, brotherly relationship. Once he becomes Darth Vader, each evil act he commits makes it harder for him to return to the light, but ultimately escapes the dark side and redeems himself before he dies by saving his son Luke Skywalker and killing Palpatine in Return of the Jedi. Darth Vader's iconic status has made the character a synonym for evil in popular culture; psychiatrists have even considered him as a useful example to explain borderline personality disorder to medical students. Anakin's origin story in The Phantom Menace has been compared to signifiers of African American racial identity, and his dissatisfaction with his life has been compared to Siddartha's before he became Gautama Buddha. A Mexican church advised Christians against seeing The Phantom Menace because it portrays Anakin as a Christ figure. A slime-mold beetle of the genus Agathidium is named after Vader, and several buildings across the globe are regularly compared to him. 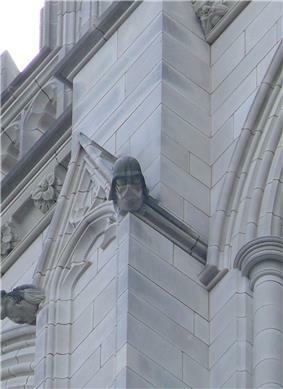 A grotesque of Darth Vader looms over the east face of the Washington National Cathedral's northwest tower. During the 2007–08 NHL season, Ottawa Senators goaltender Martin Gerber performed so well in an all-black mask that fans endearingly termed him "Darth Gerber". Many commentators and comedians have also evoked his visage to Bunky Echohawk. In 2005, Al Gore referred to Tele-Communications Inc.'s John C. Malone as the "Darth Vader of cable", and political strategist Lee Atwater was known by his political enemies as "the Darth Vader of the Republican Party". Bortolin, Matthew (2005). The Dharma of Star Wars. Wisdom Publications. Bowen, Jonathan L. (2005). Anticipation: The Real Life Story of Star Wars: Episode I-The Phantom Menace. iUniverse. 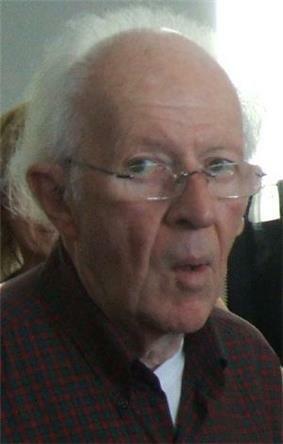 Kaminski, Michael (2008). The Secret History of Star Wars. Legacy Works Press. ^ Helinski, Keith. ""Revenge" Is Just Too Sweet", moviefreak.com. Retrieved May 5, 2007. ^ Winzler, Jonathan W. "The Making of Star Wars: Revenge of the Sith (Star Wars)", Powell's Books, April 2005. Retrieved May 5, 2007. ^ "AFI's 100 Years... 100 Heroes and Villains". afi.com. Retrieved May 21, 2010. ^ a b c d e "Vader, Darth". Databank. ^ a b "Skywalker, Anakin". Databank. ^ Biodrowski, Steve. "Star Wars : The Original Trilogy – Then And Now". Hollywood Gothique. Retrieved March 28, 2008. ^ "Lawrence Kasdan". Star Wars. Archived from the original on June 6, 2008. Retrieved March 28, 2008. ^ a b Star Wars Episode IV: The New Hope Strikes Back, Special Edition (DVD, 20th Century Fox, 2004), disc 1. ^ Star Wars Episode VI: Return of the Jedi, Special Edition (DVD, 20th Century Fox, 2004), disc 1. ^ Kottler, Jeffrey A.; Leah Brew (2007). Applied Helping Skills: Transforming Lives. SAGE. p. 67. ^ Star Wars Episode I: The Phantom Menace (DVD, 20th Century Fox, 1999), disc 1. ^ a b Star Wars Episode III: Revenge of the Sith (DVD, 20th Century Fox, 2005), disc 1. ^ Kapell, Matthew; John Shelton Lawrence (2006). Finding the force of the Star wars franchise: fans, merchandise, & critics. Peter Lang. p. 137. ^ a b c Hsu, Jeremy (June 8, 2010). "The Psychology of Darth Vader Revealed". ^ Nama, Adilifu (2008). Black space: imagining race in science fiction film. University of Texas Press. ^ "Bush, Cheney and Rumsfeld are now species of slime-mold beetles – but strictly in homage". Cornell News. ^ Egan, Timothy (June 29, 1986). "Focus: Seattle; Creating An Office Empire". ^ "the bell awards – Tom Graff (interview)". Belltown Messenger. June 2007. Retrieved May 8, 2008. ^ "Sens' Gerber has new mask, new outlook on season". Tsn.ca. September 24, 2008. Retrieved June 17, 2010. ^ "Bunky Echohawk". Ethnic Paintings. ^ "Transcripts". The Situation Room (CNN). Retrieved April 27, 2008. ^ "The Daily Show: Cheney Camera 3". ^ The 100 Greatest Movie Characters"Empire's". Empire Magazine. Retrieved May 21, 2010. ^ The 100 Greatest Movie Characters"Premiere Magazine's". Filmsite.org. Retrieved May 21, 2010. ^ "Ultimate Super Heroes, Vixens and Villains Episode Guide 2005 – Ultimate Super Villains". TVGuide.com. Retrieved November 7, 2010. ^ "Darth Vader/Anakin Skywalker is #1". IGN. Retrieved December 6, 2010. ^ "AFI's 100 Years... 100 Movie Quotes: Official Ballot". ^ Ford, Rebecca (October 15, 2011). "George Lucas Makes Surprise Appearance at Spike TV Scream Awards". ^ "Darth Vader is number 25". IGN. Retrieved December 6, 2010. ^ "Pro-Western Parties, Not Darth Vader, Set to Win Ukrainian Elections"
^ "Ukraine's Darth Vader candidate denied vote after refusing to remove mask"
^ Two men named Darth Vader were candidate at the 25 May 2014 Kiev mayoral election and the Odessa mayoral election of the same day. 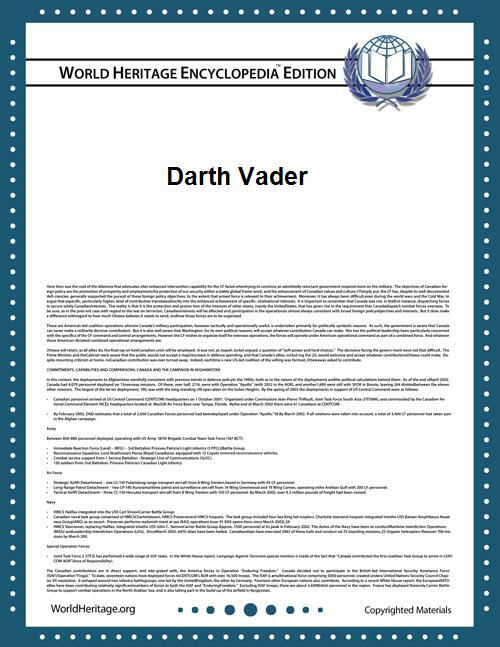 A man named Darth Vader earlier had submitted documents to be registered as a presidential candidate in the 25 May 2014 Ukrainian presidential election; but his registration was refused because his real identity could not be verified. In the 2014 Ukrainian parliamentary election Darth Vader and Star Wars characters like Chewbacca, Princess Amidala and Yoda ran for seats in the Ukrainian parliament. "The Imperial March" – the theme music that accompanies Vader's appearances in The Empire Strikes Back and Return of the Jedi as well as scenes where Anakin becomes more aggressive and unstable in Attack of the Clones and Revenge of the Sith. The character has gained much positive reception as a classic film villain. 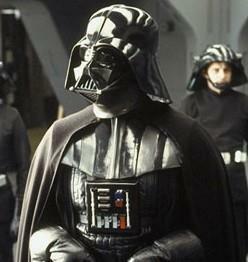 Darth Vader ranked number two on Empire magazine's 2008 list of The 100 Greatest Movie Characters. Premiere magazine also ranked Vader on their list of The 100 Greatest Movie Characters of All Time. On their list of the 100 Greatest Fictional Characters, Fandomania.com ranked Vader at number 6. Darth Vader was also the #1 supervillain on the Bravo series Ultimate Super Heroes, Vixens and Villains. Darth Vader was also ranked as #1 in IGN's list of top 100 Star Wars characters. Furthermore, Darth Vader's quote in The Empire Strikes Back — "No, I am your father" (often misquoted as "Luke, I am your father"), — is one of the most well known quotes in cinema history. The line was selected as one of the 400 nominees for the American Film Institute's 100 Years... 100 Movie Quotes, a list of the greatest American movie quotes. Vader received the Ultimate Villain recognition at the 2011 Scream Awards. Many films and television series have paid homage to Darth Vader. Marty McFly in Back to the Future (1985), dressed in a radiation suit, calls himself "Darth Vader from the planet Vulcan" to convince the past version of his father to ask his mother to a dance. Rick Moranis plays "Dark Helmet" in the Star Wars parody Spaceballs (1987). In Chasing Amy (1997), Hooper X speaks at a comic convention about Darth Vader being a metaphor for how poorly the science fiction genre treats black people; he is especially offended that Vader, the "blackest brother in the galaxy", reveals himself to be a "feeble, crusty old white man" at the end of Return of the Jedi.